Welingkar MBA/PGDM Admissions are done on the basis of CAT/XAT/MAT/ATMA/ CMAT/ MHCET/ GMAT Scores. 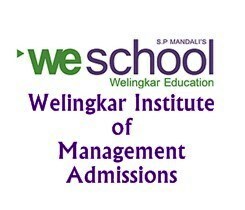 Popularly known as WE School, Welingkar Institute of Management is a private autonomous business school that offers PGDM Program in management. Candidates must note that PGDM offered at WE School hold equal weightage as that of an MBA degree. Welingkar Institute offers Postgraduate programmes, part-time degree programme, special courses, certificate programmes and other programmes. This page gives the complete details on Welingkar MBA/ PGDM Admissions 2018. Prin L.N Welingkar Institute of Management Development & Research is a private autonomous business school with its campuses located in two locations i.e. Bangalore and Mumbai. Established in 1977 and affiliated to UGC and AICTE, Welingkar Institute of Management offers Post Graduation Diploma in Management (PGDM) in Full-time, Part-time, and Executive trades. Apart from Full time and 11 Month Postgraduate courses Welingker also have Part-time and Executive PGDM courses in Bengaluru and Mumbai Campus. Educational Qualification: The candidates must have scored minimum 50% of their Bachelor’s degree of minimum three years from MHRD/AICTE/UGC affiliated colleges. Final Year Students: Applicants who are in the final year of their graduations can also apply or the admissions to the Welingkar Mumbai and Bangalore campuses. Their graduation must be completed before the commencement of the course with minimum 50% marks in aggregate. The application process for the Welingkar Bengaluru and Mumbai Campus has started. The candidates willing to seek admission into PGDM course need to fill up the application form. The applicants have to follow the link given below to apply online. However, they also have an option to buy the application form from the Mumbai and Bengaluru campus for all the programmes. Applicants must also note that there is a common application form for the admissions to both the Welingkar campuses. STEP 1: Applicants have to apply either online only but they can either apply by following the link given above or they have to personally purchase the Welingkar application form from the Welingkar offices. STEP 2: After the successful payment of the application form, applicants will get the form number and the password which will be used as the login Id and Password for the authentication. STEP 3: Applicants will now have the access to the application form, where they have to enter their academic and basic details that must match with their documents. STEP 4: After filling out the application form with the required details, applicants can now download the PDF form. STEP 5: Applicants have to now write a handwritten essay as described on the printout of the application form before its submission. One Recent passport size colour photograph to be pasted o application form. Attested photocopies of mark sheets of graduation. Attested photocopies of mark sheets of class 10 and 12. Degree certificate in case applicant has completed their graduation. Photocopies of Entrance test scorecard. STEP 7: Now applicants have to send the application form along with the supporting documents enclosed in the envelope provided by the institute to the Welingkar Mumbai campus. The applicants can make the payment of Welingkar Application form in two modes. The candidates should know that the application fees should be payable only once. The two of the modes to pay the application fee is given below. Cash: To be paid at the Welingkar offices at the time of purchasing the application form. Demand Draft: Send a DD of Rs. 1500 in favour of “Prin. L. N. Welingkar Institute of Management Development and Research” along with student contact details to the Institute’s address Mumbai given below and the application packet will be couriered to applicants address. Applicants have to submit their application form via registered post/ Speed post to the Mumbai campus before the due date. Applications reaching after the due date will be rejected and will not be entertained in any case. It is advised to send duly filled application form enclosed with described documents. Application Fee - The application fee for PGDM course is Rs.2000. The candidates applying for the PGDM course in any specialisation would be required to make the payment of the application fee in order to proceed further in filling up the application form. The application fee can be paid via online or offline mode. Course fee given below is for the PGDM, 2 Year full-time management program only. Tuition fee and other charges are common to both the campuses however hostel fee varies slightly between both Mumbai and Bangalore campus. There will be a two-stage selection process of the eligible candidates i.e. Stage 1 and Stage 2, where Stage 1 will comprise of 260 marks and Stage 2 comprise of 220 marks that make the total selection process of 480 marks. Only the merit students who have scored best marks in both the stages will be admitted to PGDM program. It is to be noted that no discrimination will be made on the basis of the state from which graduation certificate is obtained. There are no reservations for linguistic minorities either. Note: Marks will be given in each section via statistical normalisation process. Written Test: Candidates will be assigned a score out of 100 using a statistical normalisation process based on the percentile provided by the student of the entrance exams. In case, the student is given many test percentiles; the highest will be considered. Psychometric test: It will be a computer based online test aimed at identifying the personality traits. Of the candidates. Past Academic Performance: Candidates will be assigned marks out of 100 for their previous academic record which includes marks for percentage obtained in Class 10, Class 12, Graduation and Post-Graduation (if applicable). In case a student appears for Graduation or Post Graduation, the percentage column will be blank and if any candidate fails to provide the documents related to marking sheets, they will be awarded ten marks only. Only those applicants who are scoring more than 220 marks in Stage 1 Selection process will be invited to the Stage 2 of the selection process. Scores in Stage 1 of the selection process will be a composite score of entrance test, past academic performance, psychometric test, and work experience. Stage 2 of the application process will be of 220 marks whose marks distribution is as follows. Group Discussion (GD): Applicants have to go through the Group discussion carried in either Mumbai or Bangalore campus determined by the Institute. They will be awarded Marks out of 100 in the group discussion based on their performance. Personal Interview (PI): PIis aimed at evaluating the students from an overall perspective, and suitability and capability to pursue a management program. The interview would also be used as a mechanism to judge such other design competencies as observation, empathy, creativity, spotting opportunities, visualisation among other aspects. Applicants will be awarded marks out of 100 on the basis of their performance in the personal interview. Final Selection: The final selection of the students is based on the overall performance on 480 marks. Students will be offered admission to a program basis of their preference AND their suitability with a program identified on the basis of their performance in the entire process. The exam pattern of the Welingkar Institute of management will be based on the entrance exams i.e CAT, XAT, MAT, ATMA, CMAT, MAHCET, and GMAT. Applicants can refer to the links given below for the detailed information and important dates of the exam. Scholarships are awarded to the meritorious students under the name of "Protsahan-Scholarships". Under this scholarship scheme, top-ranked students who have qualified fo the admissions to Welingkar Institute of Management and have top positions as per the selection criteria. Placement packages offered in Welingkar PGDM in the academic session 2014-16. More than 177 companies visited Welingkar for campus placement.